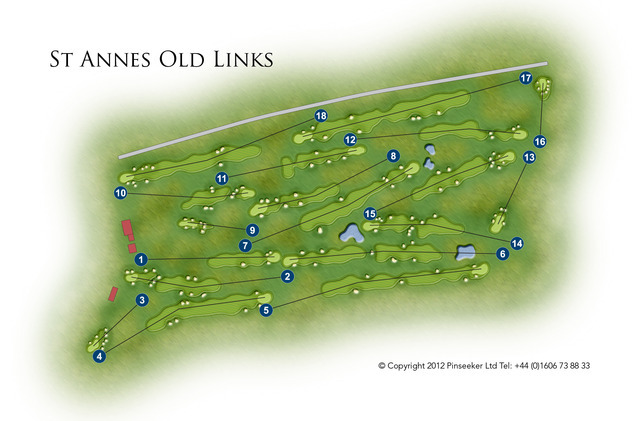 The course is true links with the championship course measuring 6941 yards having a SSS of 74. Over many years it has been used by the R & A as a Final Qualifier for The Open mostly recently in July 2012. Our fairways have been graced by such renowned golfers as Water Hagen, Arnold Palmer, Jack Nicklaus, Gary Player, Sam Torrance, Rory McIlroy, and more recently Bubba Watson to name but a few. Plan ahead of your visit to S.A.O.L. and make the most of your round by reviewing our course map; together with helpful tips from our Professional, Daniel Webster. In addition to the championship course, we have the white course measuring 6689 yards, yellow 6326, and red 5646 yards. See every hole on the course with our flyover experience at St Annes Old Links Golf Club, thanks to www.heliphoto.biz They are located at each indivdual hole guide situated above.